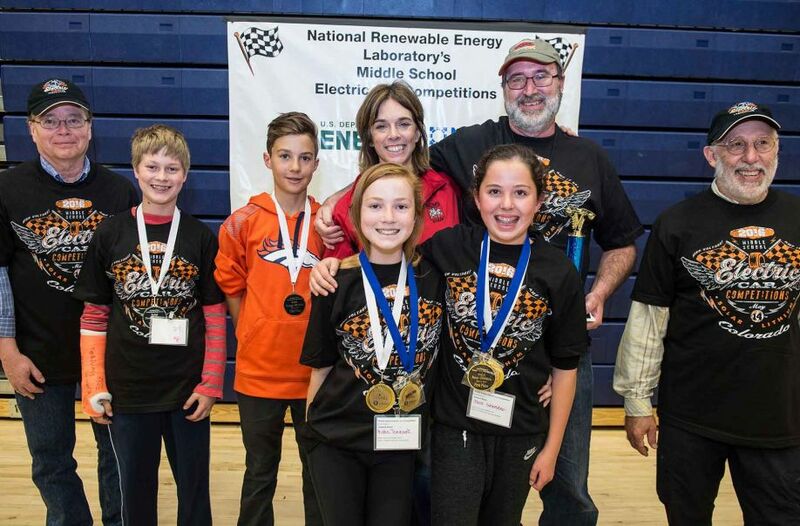 The race, sponsored by the Energy Department, its National Renewable Energy Laboratory (NREL), the Alliance for Sustainable Energy, Jeffco Public Schools, and Dakota Ridge High School, is designed to boost interest in science, technology, engineering, and math (STEM) fields. Dreams can travel a long way—longer than the 20 meters of black neoprene racetrack used in the annual Junior Solar Sprint and Lithium Ion Battery Car competitions. And on May 14, a rainy Saturday, young dreamers came from as close as six miles away in nearby Ken Caryl Middle School to as far away as 100 miles from tiny Calhan Middle School, converging on Littleton, Colorado. 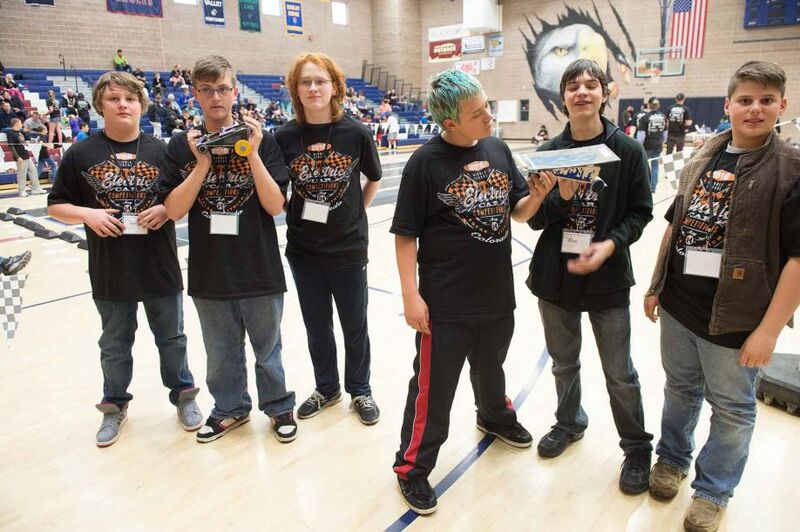 There, 57 student teams from 15 Colorado middle schools gathered in the checkered-flag bedecked Dakota Ridge High School gymnasium to test cars—and their visions of the future. Because the day was overcast, the event was held indoors, and the 26 teams with solar cars were issued two AA batteries apiece to power their entries. But despite the change in venue, the nearly 200 student racers—as well as supportive teachers, family, and friends—didn't seem to mind. 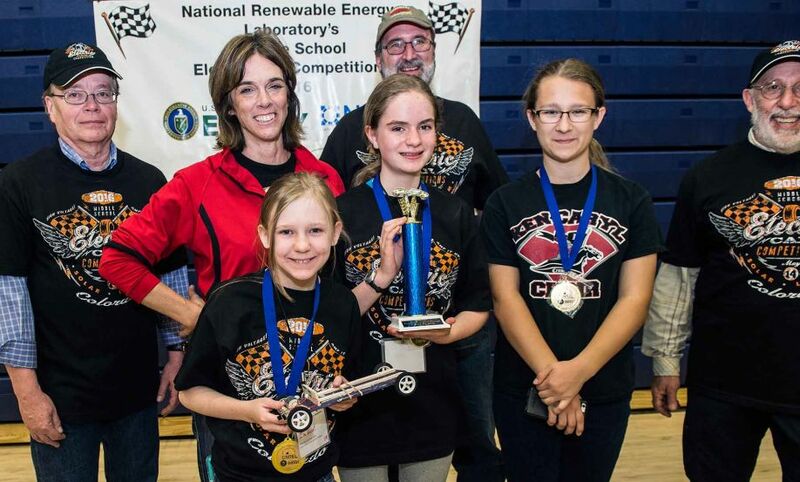 The race, sponsored by the Energy Department, its National Renewable Energy Laboratory (NREL), the Alliance for Sustainable Energy, Jeffco Public Schools, and Dakota Ridge High School, is designed to boost interest in science, technology, engineering, and math (STEM) fields. That theory played out frantically in the repair area where team members were making final adjustments in hopes of squeezing a bit more speed out of their entries. Sebastion Rascon and Javi Hernandez experimented with their "Bat Mobile." "We're putting the battery on upside down. It adds more power," Hernandez said. A bit of glue, a tug on a wire, and then good to go, as the two seventh-graders from University Schools in Greeley ran to the gym when Linda Lung, NREL's workforce development and education programs coordinator, summoned teams for the first heat. The races were finally on—as racers carefully lined up cars at the start while "catchers" waited at the finish line. Dreams were ready for takeoff. Shortly before 10 a.m., in the first wave, a Ken Caryl Middle School (KCMS) solar car streaked to victory, covering the 20 meters in 6.658 seconds. Not long after, a KCMS battery vehicle blazed to victory in its first heat. In the stands, KCMS coach Christine Hruby and her co-coach/husband Dave Wehrlen cheered, yet Hruby remained a bit reserved. "We had one car go all the way to the semi-finals last year, and then it didn't finish," she said. The veteran coach knew races can be fickle. Just ask some of the kids from Calhan Middle School, who learned that lesson as the day unfolded. Christian Maples, his hair streaked blue and green like "FBI Covert Ops," one of the four Calhan cars, was stoked. Last year, a Calhan car got the dreaded "DNF:" did not finish. This time, after early success, things looked better. "This is really working out," said Maples, whose 'do matched "Ops" in a show of spirit. The Calhan carmakers didn't just concentrate on style. Their innovative design had three wheels. "It's sleek," Christian said, "with less friction." Another of the school's cars sported large orange rear wheels, rakish angles, and an unusual name written in pen on the base: "Space Ballz." Lane Jones, an eighth-grader, cradled the small car after its initial run. "The last time it was slow, grinding gears, but I think we've figured out," Jones said hopefully. Optimism helps dreams stay aloft. Names can be inspiring for a project. Starting with standard monikers such as "Lions" and "Eagles," participants stretched their creativity from "Starchasers" and "Galaxy Roses" to the more fanciful "Dumbo," "The Re-Volts," and "Watermelon" (eventual winners of this year's Spirit Award). Perhaps the most ironic was "7th Graders Who Aren't That Imaginative." A catchy name alone wouldn't cut it. "Pun in the Sun"—a paper airplane-styled vehicle with puns written all over it—had been grim in the gym. So Holly Carleton and Maya Potter from University School tinkered on one of the two practice lanes. But their strategy wasn't limited to branding. The girls wanted something fast as well as clever. "We started building it for a class project in March," Carleton said. "We've been having some trouble with our car turning and slowing down," Potter said. "We put the battery on the opposite side of the most weight, and started running it backwards." Still, the car's creative concept was hard to resist. Carleton's face lit up as she explained: "We have a bunch of puns written on the car." She paused to scan the surface, then read: "What's a frog's favorite drink? Croak-a-cola. What do you call a parrot with no food? A polynomial." After a test run or two, they were satisfied. For the record, Carleton said she hopes to merge engineering and acting as an adult, so her creativity won't be contained. "I want to go into the clandestine services—like espionage," she said. Potter also has a clear concept of her future: "I want do some sort of thing with chemicals. I just want to be in a lab." Both agreed the competition helped them get a rolling start toward their goals. As much as weeks and months of work go into getting the cars ready, it also takes plenty of organization to ensure things roll smoothly. That's why many NREL employees volunteer—a few of whom have been there nearly all of the 26 years in the Colorado event. NREL Laboratory Fellow Dave Ginley, the chief judge for the solar races, chose to be at the race rather than in Loveland Ski Area celebrating the end of the season with his fellow ski patrollers. Ginley, who guessed he has been at "20-ish" of the events, provided not only scientific expertise but a quick wit to go with the quick cars. Addressing one heat, Ginley said "think photonic thoughts" before giving the countdown. Another vet watching the starting line was Jeff Alleman, using his smartphone to video each start to ensure nobody bolted too early—possibly by accidently nudging a car. Things like that happen from time to time. He recently had to disqualify a contestant at the National Science Bowl in Washington, D.C., after one car got an unintentional push. "I felt bad, but there were seven other teams that started correctly." Keeping order ensures that everyone is on equal pavement. According to the rules, all contestants begin with the same basic kits; then each can add their own signature. George Matsumura, a seventh-grader from Southern Hills Middle School in Boulder, did just that. He printed the chassis on a 3D printer in the Boulder Library. The result was a compact car for the "4DSquared" team. The approach "gives you flexibility and accuracy in design," the aspiring engineer said. Perfectly legal in the competition, the manufacturing method may signal a new path for future racers. As the fastest cars advanced, others did not. Mishaps occurred, and some cars veered off course, losing contact with guidelines and resulting in disqualification. Others had trouble getting out of the gate—stalling or creeping over the finish. "Slow and steady," Lung called out several times as the crowd tried to encourage a balky vehicle by stomping on the metal bleachers. Sometimes, in the heat of the heats, things just…happen. The Calhan crew knows. "Space Ballz" was poised for an important heat toward the end of the competition, its times having improved each round—but when one of the final heats began, the car shot crazily across another lane. "Space Ballz" was history. In the aftermath, the team assembled, and blame fell on an eyelet—the wire loop attached to the guideline to keep a car on track—and, just perhaps, some user error in securing it properly. Accusations? Blame? None of that. "Now you'll know what to do next year," Jones said, consoling his younger teammate who winced a bit, then smiled. But all wasn't lost. "Space Ballz," it turns out, took home an award: a third place in design. The kids—one who plans to be an Air Force engineer, several others wishing to become video game designers, and another dreaming of become a John Deere mechanic—were tickled by their triumph. 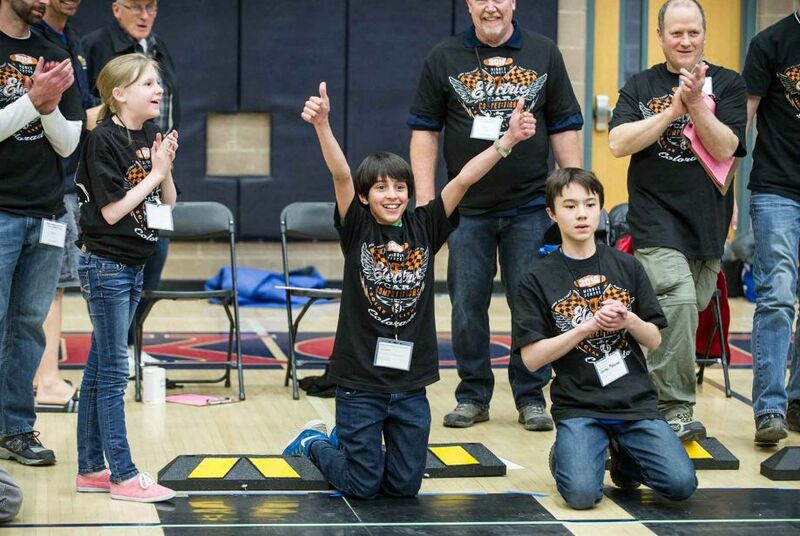 Meanwhile, KCMS—and its two top teams—turned out to have plenty to smile about, taking first in both solar and battery divisions. "It was great. We've never won both before," Hruby said. Aspiring pop singer Zoe Wurst, part of the team building the fastest battery car, said afterwards, "I really liked competing in the races." Katie Tennant smiled, saying "it was great seeing our car run. It made everything worthwhile" after her KCMS Solar 1 took first place. Another team member, Amanda Mohrlang, who once wanted to be a biologist but now is uncertain, added, "I really enjoyed the environment and how everyone was excited for everyone else. I also loved how organized it was." KCMS racer Rebecca Ray said she "enjoyed the experience because it was fun to build the car with a team and learn how everything worked together." By the way, Ray wants to become an engineer. Aside from the thrills of competition, there are other benefits to such events, ones that last long after the clamor has died. Ginley explained why he comes back year after year: "One, it's fun. More importantly, we've seen kids come here, get inspired by the races and energy, and end up as graduate students, postdocs, and staff members at NREL." As the race organizers began disassembling the track, Lung noted that "this year was great, though we were a little disappointed with the weather—but the kids and cars were fabulous." The opportunity is there for learning and success. "All the cars start out with same basic components, but you can see all the creativity, and ingenuity of all these kids. They are so excited. We've seen teams that are here at sixth grade, and they come back in seventh, and by eighth grade they have screamin' fast cars." That path lies ahead for Calhan. Laurie Ochsie—Calhan's seventh- and eighth-grade science teacher, coach, and for the day, driver of the short bus—reflected on the outcome. Because there are only about 40 kids in each class, she opened up the team this year. "Kids were begging me to be on the team," she said. And even if they aren't always the most qualified, they benefit. "They really learn something and have fun." The positive energy is infectious. On Calhan's long trip back to their town of about 800, the atmosphere was electric for future electric car competitions. Ochsie recalled that "sixth-graders were asking me 'Can I be on the team next year? I really want to be in this!'" That's how dreams begin. Expect dreamers to travel from around the state next year for a chance to go 20 meters—and way beyond.